Shame so few, 347, were there to see it. But that is quibbling. For one, the Tynesiders have a first win in six games. Better still, they are into the last eight for the second year running and the fifth time in their history. Luton Town away, awaits, and what more beyond? For while Ian Bogie’s men were some way off their best yesterday, they battled from behind and battled on. Won. It was all anyone would ask for six minutes in. Nathan Jarman slipped a pass right to Anthony Wilson, and his low cross appeared to be driven under his own crossbar by Eddie Odhiambo. Gateshead simply hadn’t started, and paid the price. But they slowly began to exert and assert themselves. Yemi Odubade’s long-range free-kick was palmed behind by former Blyth Spartans goalkeeper Dan Lowson. Jon Shaw saw a header blocked by Greg Young, possibly his hand even, then stabbed Josh Gillies’ cross wide with the goal at his mercy. He made amends soon enough. First though, at the other end Jarman headed on to the roof of the net and Paul Clayton flashed wide. But the hosts were in control now, those mere interruptions in the overriding flow of play, and Gateshead dominated the end of the opening half, then made good on that superiority. Gillies tested Lowson from 25 yards, left-peg. Micky Cummins fired at him too, from similar range. Then, on 37 minutes, Shaw did what he does. Odubade ran on to an incisive pass by Gillies, into the box. 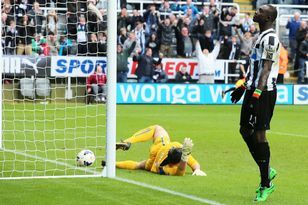 And when he was felled by Young, Shaw confidently drilled the resulting penalty low to the goalkeeper’s right. One-one, 30-up for Shaw. Alas, a groin strain prevented his further involvement. No matter. Though they started the second half as they had the first, a tad on the back foot, Gateshead re-awoke before the hour. Gillies, enjoying a fruitful night, did well, isolated, to earn a corner, and from Odubade’s centre from the left-hand flag, James Curtis glanced a header beyond Lowson. He’s only 27 behind Shaw now. “We’re going to Wembley,” sang the Heed Army, short on soldiers last night. If they are, they may also have Phil Turnbull to thank. Later, Chris Moore stabbed straight at Lowson, Odubade blazed over and, when set up by Odhiambo, crashed a close-range effort into the goalkeeper’s legs. But on 72 minutes, Turnbull lost possession deep in Alfreton territory, team-mates committed in numbers. Nathan Arnold counter-attacked, only Ben Clark between him and Clayton. Yet before Arnold could slip his colleague past Clark and clean through on Tim Deasy, Turnbull recovered his ground and tripped the visiting player. Cynical, yes. A yellow card, for sure. Worth it? Unquestionably. It ensured Gateshead progress, and that is all that matters.